Many herbs are usually recommended for the natural treatment of fibroids and many of them help in various ways such as shrinking fibroids, detoxification, toning the uterus, etc. One of the popular herbs that is usually recommended is red raspberry (rubus idaeus and r. strigosus) taken in the form of a tea. Is there are viable connection between drinking red raspberry leaf tea and fibroids treatment? Raspberries are known for being nutritional powerhouses mainly due to the antioxidants that they contain which help to prevent free radical damage to healthy cells in the body which prevents various chronic diseases such as heart disease, cancer, diabetic neuropathy, cataracts, etc, as well as various degenerative diseases. It is also a common natural remedy for diarrhea. Red raspberry leaves are also very healing and one of the best herbs to treat a variety of gynecological issues and unlike many herbs or medications, they are completely safe to use by pregnant women and in some cases can help pregnant women in various ways including those who have suffered a miscarriage before (reducing risk of miscarriage). It is also recommended to help ease morning sickness as well as labor. The connection between red raspberry tea and fibroids is related to this herb’s ability to strengthen and tone the uterus. Uterine tonic herbs are some of the safest herbs for natural treatment and can be taken on a long-term basis. 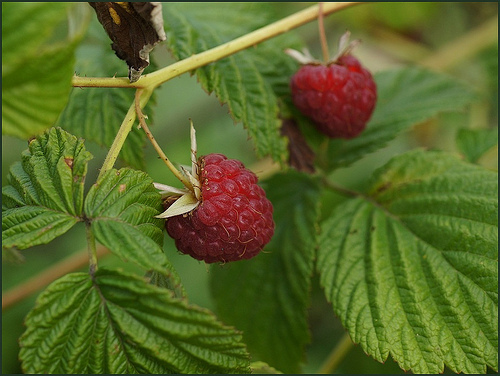 By strengthening and toning the uterus, red raspberry leaf can help to promote gynecological health as well as promoting hormone balance which is the enemy of fibroid growth. Fibroids usually thrive and grow rapidly in an estrogen dominant state and preventing estrogen dominance can help to not only heal the body of fibroids but also help prevent them from returning which is why red raspberry leaf tea is one of the popular herbs recommended for natural fibroids treatment. The connection between red raspberry leaf tea and uterine fibroids and how it strengthens and tones the uterus is because of its soothing action as well as its astringent properties which result from the high levels of tannins found in the leaves of this herb. Tannins are present in the leaves of most herbs and plants and represent various compounds which have many healing properties including being antimicrobial making them effective against bacteria, viruses and fungi. These compounds also contain astringent properties which in addition to helping strengthen and tone the uterus can help speed up blood clotting which is why this herb is also recommended for regulating heavy menstrual bleeding. The astringent properties also have positive effects on the immune system and liver and help reduce blood pressure. While using red raspberry tea for fibroids is popular, you can also use it in the form of a tincture, capsules, etc. When using this as a tea, you should add one or two teaspoons of the dried herb to a cup of boiling water and steep for about 15 minutes. Strain and drink this as often as necessary but usually three times a day. Or you can use a red raspberry extract. When using a tincture, take one teaspoon 3 times a day. While the connection between red raspberry leaf tea and uterine fibroids is exciting for those interested in natural healing methods for uterine fibroids, you still need to be aware of any safety concerns but as mentioned before raspberry is so safe that even pregnant women can take it. It can also be given to infants to treat diarrhea but in lower doses than would be given to older children or adults. One of the few safety concerns when using red raspberry is that like with most things, some people may be allergic to this herb. If you are allergic to this herb, either stop using it or reduce the dosage. The above is just a bit of information about the connection between red raspberry tea and uterine fibroids natural treatment. For complete guidance on the best herbs for healing and preventing fibroids and how to use them as well as many other natural treatments for fibroids, you need the Fibroids Miracle guide. Find out more about this scientifically proven holistic guide here. Prev Are You Trying To Get Pregnant With Fibroids? Next Discover How Serrapeptase Enzyme Works Wonders In Shrinking Uterine Fibroids! I have been reading that raspberry leaf should not be taken if you have fibroids because it promotes production of estrogen which feeds the fibroids. Is this accurate information? Excessive estrogen does help fibroids thrive, however, the reason that raspberry and many other herbs are recommended is because they have a weaker form of estrogen than the natural estrogen produced by the body. So if your fibroids are caused by excessive estrogen produced by your body, the weaker estrogen (from herbs) helps to replace the stronger estrogen produced by your body which helps to reduce the strength of the total estrogen in your body which may help with fibroids. I hope that makes sense. The weaker estrogen replaces the stronger estrogen.